Lost in the largely meaningless political Kabuki theatre being staged on Capitol Hill is the fact that the economy is deteriorating. Real average weekly earnings in July declined for production and non-supervisory workers. It was down 0.01% from June to July and down 0.22% from July 2017. For all employees, real average hourly earnings declined 0.20% from June to July but was flat year over year. Real earnings is not a statistic discussed in the mainstream financial media, but it reflects the ability of the average household to consume non-discretionary goods and services. It also reflects the ability and willingness of the average household to borrow. The chart above shows the year-over-year growth rate of real consumer credit outstanding with and without student loans. As you can see, ex-student loans (blue line) the rate of growth in outstanding consumer debt (not including mortgage debt) is close to zero. The increase in consumer credit reported for June (the latest month for which data is available) was $10.2 billion vs $16 billion expected. It was down from May’s increase of $24.6 billion. The perceived growth in GDP is inextricably tied to the growth rate in the use of debt. The near-zero growth rate in consumer credit is thus consistent with the view that the U.S. economy is weaker than the promotional propaganda flowing from Wall Street and DC. “Student Loans Are Starting To Bite The Economy” – That was title of a Bloomberg article last week. With $1.4 trillion outstanding, student loans are the second largest category of household debt after mortgages. 22.4% of all households carry student debt. 44.8% of households in the 18-34 age demographic carry student debt – that’s up from 18.6% in 2001. Not discussed by the article is the estimated that 40% of borrowers will default on their loans by 2023. The current 90-day “official” delinquency rate is 11.2%. But this number is highly deceptive because 30% of all student loans are in deferment or forbearance. These loans are put into “remission” for many reasons but the most common is that it enables the borrower who can’t make payments to defer the stopwatch on delinquency/default. While it’s possible that the student loan problem is affecting potential demand from potential homebuyers, most people who have student debt also have credit card and auto debt. There are also schemes such as an employer student loan repayment that help employees pay back their student debt. So it’s not clear that student loan debt alone has affected the ability of first-time buers (18-34 age cohort) to buy a home. As you can see in the chart above, total household debt through the end of March 2018 – which means the debt level is even higher now – is considerably higher than the previous peak at the end of Q3 2008. Not shown is a graph I constructed on the FRED site that added nominal GDP. The rate of growth in household debt has sharply surpassed the rate of growth in GDP since Q3 2015. This is why the economy is stalling. This is why the housing and auto markets are now in definitive contraction. It has nothing to do with the trade war or low housing inventory. It has everything to do with an economic system that is losing its ability to support the massive amount of debt that has been issued since the last financial crisis (de facto collapse). As you can see, since the middle of August, the 30-yr Treasury yield has negatively diverged from the S&P 500 after being tightly correlated for the first two weeks of August. The spread between the 2yr and 10yr treasury is at its lowest since August 2007. The Treasury curve “flattens” when the short end of the curve rises relative to the long end. The curve flattens when the market has decided that the Fed is wrong on its policy of raising the Fed Funds rates because the economy is slowing down. Large Treasury buyers pile into 10yr and 30yr Treasuries on the expectation that a deteriorating economy will force the Fed to reverse course and lower rates again. The chart above reflects the market reacting to the steady flow of negative economic reports. If the Fed is right, we should see the 30yr yield “catch up” to the SPX. Conversely, if the market is right, the chart above is yet another warning sign of an eventual stock market “accident.” I have no doubt that the Fed is wrong. That said, the Fed has painted itself into a corner on rates. Contrary to the Fed’s public propaganda of “low inflation,” the Fed is well aware of the true rate of inflation – inflation created by the Fed’s monetary policy since 2008. If the Fed does not act to tighten monetary conditions, price inflation will continue to accelerate and inflict serious damage to the U.S. economy. 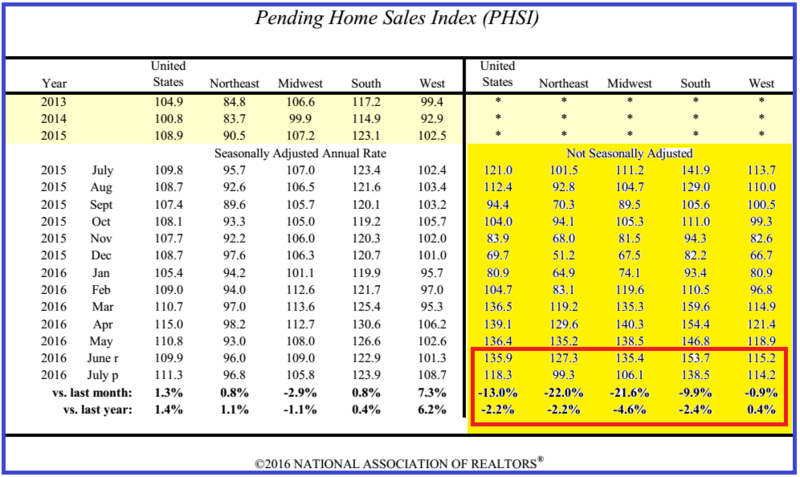 Today the NAR released its “pending home sales” index. On a “seasonally adjusted annualized rate” basis, it showed 1.3% gain over June. June’s original report was revised lower from +.8% to -.2%. Mathematically, this downward revision enabled the National Association of Realtors to report a gain from June to July. Keep in mind this is on a “seasonally adjusted” and “annualized rate” basis. Now for the real story – at least as real as the reliability of the NAR’s data sampling techniques. In the same report the NAR shows the “not seasonal adjusted” numbers. (click on image to enlarge) On a year over year basis for July, pending home sales were down 2.2%. They were down 13% from June. This is significant for two reasons. Using a year to year comparison for July removes seasonality and it removes the “seasonal adjustments.” Just as important, if you look at historical data for existing home sales by month, “seasonality” between June and July is non-existent – i.e. in some years June sales exceed July and in other years July exceeds June. The not seasonally adjusted data series is much more reflective of the real trend in the housing market that has developed this summer than is the manipulated SAAR number vomited by the NAR’s data manipulators. The 13% from June to July should shock the hell out of housing market perma-bulls. FURTHERMORE, the not seasonally adjusted numbers are consistent with the highly correlated mortgage purchase applications data. “Pending” sales are based contracts signed. Concomitantly with signing a contract – the NAR reported that 80% of all existing home buyers in July used a mortgage – the buyer needs to file a purchase application. But the Mortgage Bankers Association reported that mortgage purchase applications hit a 6-month low in July. The mortgage applications data contradicts the NAR’s pending home sales report on a SAAR basis but is entirely consistent with the pattern in the not seasonally adjusted data. The not seasonally adjusted data are pointing to a rapidly developing housing market implosion – 13% drop in contracts signed from June to July in a two-month period that has little if any seasonality and with 30-yr fixed mortgage rates hitting all-time lows. Just like the big bubble which finally exploded in 2007-2008, I was early in my call on Housing Bubble 2.0 (HB 2.0). Because it takes a lot of capital and “inertia” to move the housing market, directional movements take time to develop and they become fast-moving trains with no brakes – until they either hit a wall or hit the ground. But change in direction happens suddenly. When prices are moving up, the market becomes very illiquid on the “offered’ side and buyers become ravenous. This occurred because the Fed dedicated $2 trillion of it’s QE to the mortgage market and the Government made Government-guaranteed mortgages much easier for buyers by taking the down payment requirement down to 3% and in some cases 0%. But when the market rolls over, supply quickly builds and demand disappears and the market becomes very illiquid on the “bid” side. The market is about to become very illiquid on the buyer side of the equation. The housing market is heading south now as well. It’s been my view, and I’ve supported this view with detailed analysis of new and existing home sales on my blog, that both the Government (new home sales report) and the National Association of Realtors (existing home sales report) are using their mysteriously calculated “seasonal adjustments” to inflate the true level of homes being sold on a monthly basis. MOREOVER, and this point is crucial to understand, to the extent that there are flaws in the “seasonal adjustments,” the “annualized rate” calculation compounds these flaws by a factor of 12. As you can see, the Government’s new home sales report is utterly unbelievable. In fact, the Mortgage Bankers Association has reported that mortgage applications to purchase homes hit a 6-month low in July. New home sales are based on contracts signed. With 93% of all new home buyers using a mortgage, if mortgage applications are not being filed, contracts are not being signed. It’s really that simple. The NAR’s existing home sales report was well below consensus expectations and showed a 3.2% drop in existing home sales from June and a 1.6% drop from July 2015. These numbers are based on closings. Again, if mortgage purchase applications dropped in June and July, we can expect (or at least should expect )that existing home sales reports for at least the next two months will show further declines. Furthermore, the NAR uses the same statistical “adjustment” model as the Government. To the extent that the NAR’s SAAR numbers showed a decline, the true decline is likely much greater. The truth from the ground, based on the extensive footwork due diligence I conduct plus emails from readers around the country reporting similar observations, is that the inventory of home listings of soaring (the published inventory reports by design have 2-3 month lag), prices are dropping quickly, the time it takes to sell a home is increasing significantly and, most important, the potential pool of middle class home buyers no longer have an income level that will support the size of mortgage it takes to “buy” a home. Short-sell ideas are starting to work again. The short-sell selections in my Short Seller’s Journal have now worked four weeks in a row. My pick from 3 weeks ago is down 6%. At one point it was down 10%. 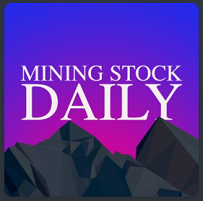 The pick from two weeks ago gave subscribers a quick 13% drop after it reported earnings and it’s still down 10%. My pick from last week is down nearly $2 (2.3%) after 2 1/2 days of trading but the puts are up 42%. 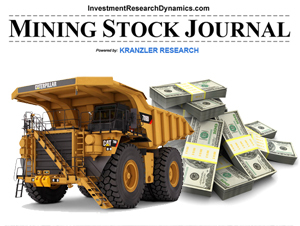 I am also making several homebuilder short recommendations now each week. 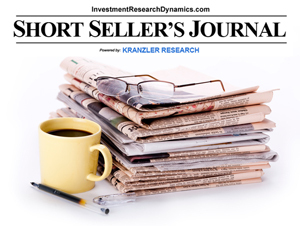 You can subscribe to the Short Seller’s Journal by using this link: SSJ subscription. Despite all of the bullhorn, rah rah rhetoric coming from the National Association of Realtor’s chief cheerleader, Lawrence Yun, the massive intervention in the housing market by the Fed and the Government is beginning to fade quickly. I guess in the face of evidence far too overwhelming and obvious to cover up with propaganda-laced sound-bytes about “strong jobs growth” and “low inventory,” the NAR has been forced to admit that the energy market depression – LINK. At some point, when the “tide does start go out,” everyone is going to wonder why the NAR’s seasonally adjusted hocus pocus data has not transmitted into actual, bona fide sales. I wrote an article for Seeking Alpha which explains the corrupted foundation underlying the NAR’s statistical witches brew. In fact, I have evidence direct from the Fed that shows the “low inventory” narrative is 100% false – sales and inventory levels are actually inversely correlated. Funny thing, that. But it won’t be funny to the people who chased the price of their dream higher by listening to the “wisdom” of their “friendly” house broker. You can read my article here: Existing Home Sales For October Drop More Than Expected. I toured some middle/upper middle neighborhoods yesterday that up until recently had very little on the market. Mysteriously, a lot of homes seemed to have popped up on the market for sale in the last few weeks. I was wondering if perhaps the home broker community had convinced their “pending” sellers to list their homes for Black Friday Month. You have wonder, what is going on that would cause someone to list their home going into the slowest seasonal period of the year for homes sales? The warning signals are coming from several sources now. Many major MSA’s have gone from apartment rental shortages to oversupply with more supply on the way; Sam Zell recently unloaded a big chunk of apartments from his flagship REIT – a repeat of a move he made in 2007; housing prices have been dropping for the better part of the last year in several MSAs – 30% All Homes Lost Value Last Year; large investment funds are now starting to unload large portfolios of homes that had been structured for high yields from rents but have significantly underperfomed. The crux of the problem is that the Fed’s massive stimulus of the mortgage market, combined with increased Government subsidization of FNM/FRE/FHA mortgage programs, accomplished no more than temporarily stimulating a small bounce in homebuying. But a large portion of this homebuying was done by “investors” and flippers. That ship has sailed as housing prices, contrary to the calculus reported by the Case-Shiller index (which Robert Shiller has admitted in the past is flawed) have been declining in most cities since the spring. Flippers are now finding themselves stuck on homes that they are unable to flip unless they are willing to eat loss. I explore the significance of the latest Pending Home Sales Index report, which has now declined in 3 or the last 4 months in this Seeking Alpha article: Pending Home Sale Indicating The Bear Is Back. This is true despite the fact that the Government just allocated more taxpayer support by rolling out a zero-down mortgage program for the low-income demographic. As I discuss in this article, mortgage subsidies won’t help a population that can’t earn enough income to support the monthly cost of home ownership. 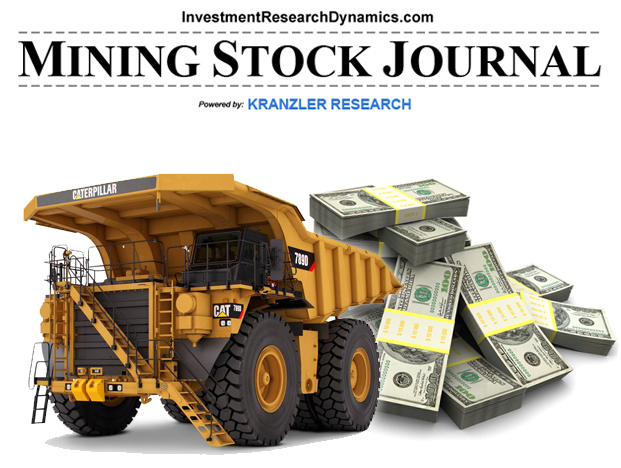 I have published a new homebuilder report which shows why this particular homebuilder is going to get cut in half in price over the next year. This company happens to focus on the lower-end homebuying demographic and it recently reported a continued decline in unit sales. This stock fell 9% after it reported and it has yet to rally back to its pre-earnings level despite the massive move up in the S&P 500. I wrote a detailed report which showed why the NAR’s existing home sales report was highly inaccurate – Highly Questionable Existing Home Sales Report. This is the second month in a row that pending home sales took a dump. Today’s report supports my analysis that existing home sales likely dropped in September. What say you, Larry? Where is all that pent-up demand from people selling their homes and “trading up?” I will have an in-depth analysis of the pending home sales report later this week. Do not get pimped into buying house now. Wait 6 to 12 months if you really want to take on that expense because you will get a much better price. The housing metrics promoted by Wall Street, industry associations and Bloomberg/Fox Biz/CNBC are just as bad as the Government’s seasonally adjusted, annualized rate pig vomit. Denver is turning into one big “New Price” sign. Also, I’ve never seen more homes “for rent” in central Denver than now. Ma n Pa investors will take it in the back side on those homes and I bet many of them are stuck flippers or “swing traders.” Unfortunately for everyone, many of the Ma n Pa retail price chasers started using mortgages to make their “investment” purchases. Many of them also checked the “vacation home” box on the mortgage application to get better financing terms. This will not end well. Inventory now is piling up across the price spectrum more quickly than the brown stuff waiting to hit the fan blades. The upper-end price segment of market has more inventory listed than I can recall seeing 2008. Some small enclaves with psuedo, over-priced mini McMansions have 15-20% of the homes on the market (see Highlands Ranch Golf Club area, for instance). The bounce in home sales since mid-2010, which has been driven by the Fed’s near zero interest rate policy and $3.6 trillion in QE, has lasted longer than I expected. However, data released recently suggests that the housing market may finally be rolling over. Both mortgage purchase applications and pending home sales declined unexpectedly in July. This data followed a large unexpected drop in new home sales in June (released at the end of July). #2 is the report posted in February. While it’s not easy shorting anything in this market, patient traders will make a lot of money shorting the homebuilder sector. The stock prices of these companies have completely dislocated from the underlying fundamentals. When fundamental reality hits, it will be a bloodbath.